•Check Shreve and click OK. Progress can be followed in the status bar. Large networks will have large topological dictionaries and will take longer to process. •Shreve stream ordering orders the network by starting at the source and travels down the network incrementing the order of the polyline. It repeats this process for every source. 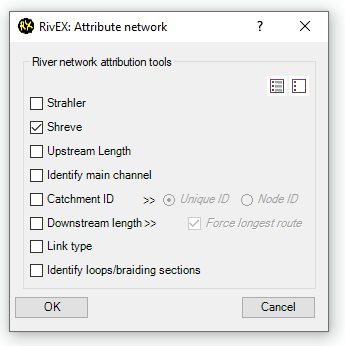 •The output of a Shreve stream order is a single field in the attribute table of your river network called Shreve with the stream order of the polyline. •Shreve stream order is not designed by multi-channelled networks. If RivEX encounters a section of multi-channel network such as a braid it will choose a SINGLE route through this section. All other polylines within the multi-channel section remain encoded as ZERO. 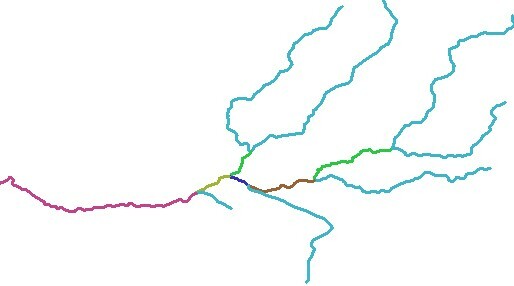 This route is based purely upon the row order of polylines in the table, i.e. the order in which it was digitised. This order is not always the main course of the river so caution should be used when interpreting the output. •Click here to be shown how to flip a single polyline.